“In today’s tough markets only businesses that deliver a seamless customer experience will grow and survive. A seamless customer experience requires all of your service providers to be aligned and working collaboratively giving service coherence. UniTeam is a unique and powerful methodology that delivers service coherence to your business through a blend of tailored workshops and on the ground operational change managers to reduce cost and improve performance turning your service providers into long term strategic partners and taking your business on a 3 step journey to even greater success”. 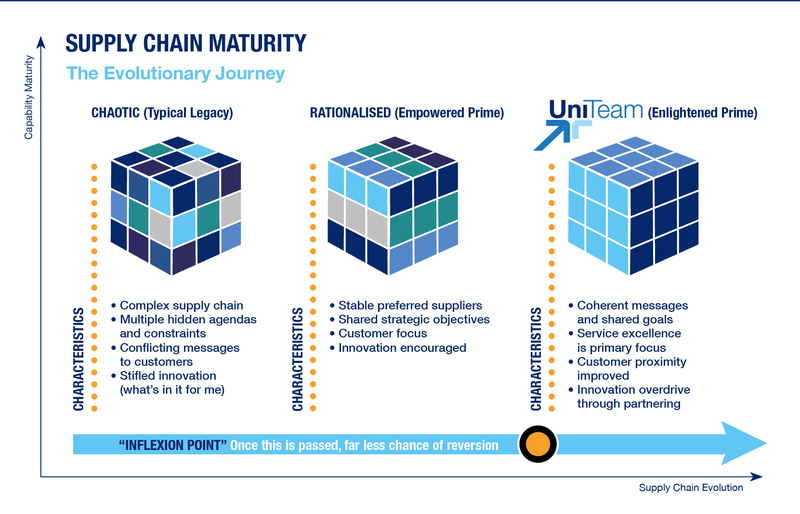 UniTeam is a powerful and unique methodology for delivering Service Coherence based on behavioural and operational change which takes your business and its supply chain on a journey to collaborative maturity. We called it UniTeam because our programme is based on creating a united team. Rather than every supplier working to its own agenda and pulling in different directions we help you to make them pull in one direction… yours. The UniTeam approach drives your business towards Service Coherence which not only gives you increased cost efficiency and operational agility it also promotes a seamless customer experience which will improve your reputation relative to your competitors and hence drive business growth. It applies equally to challenges around a supply chain made up of different subcontractors or silo’d departments within the same company. In essence UniTeam delivers benefits anywhere where an outstanding, joined up experience for your customers is important. Inflexion Point Consulting uses a unique blend of coordinated workshops and ‘on the ground’ experienced operational change consultants to take your business on a 3 stage journey to Service Coherence. A material change is necessary to effect a tangible business improvement however at Inflexion Point Consultancy we never forget that businesses are made successful by people and that as people most of us dislike change. Also if people see the change challenge as being too great they assess the probability for success and they programme themselves to accept failure as a possibility. If the change is too small, they trivialise it and subconsciously undermine it. In either case the success of your business is compromised. 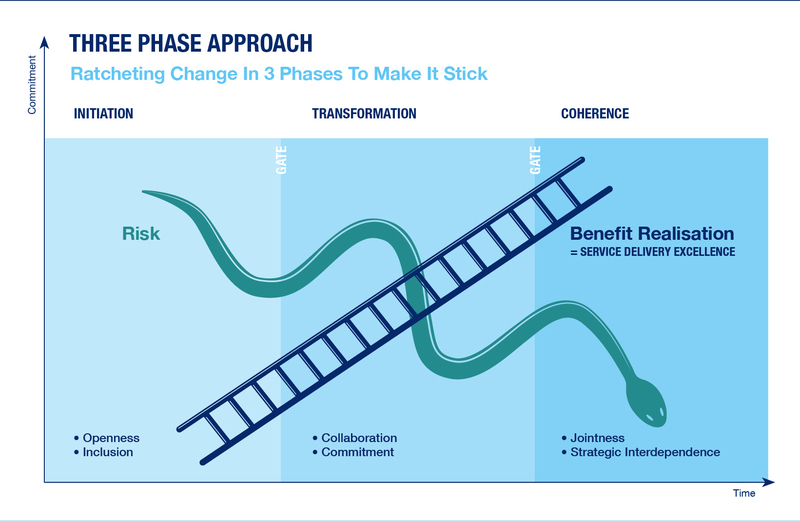 At Inflexion Point Consulting we work with you to define three clear, challenging but achievable phases of change. This makes the change more manageable ratchets the change allowing everyone to pause, take a breath and take stock of what has been achieved before taking the next step. Nobody likes change but once your business has been on the UniTeam evolution you will wonder why you left it so long. Download a printable version of the brochure which explains the concept, the approach and the benefits in more detail. You have heard the expression ‘lend us your watch and we will tell you the time’, Inflexion Point Consulting is different, we work with you to define your journey and then we pilot you through it celebrate success and then work on the next step. Business never stands still. Many consultancies only help you discover the wrong answers, Inflexion Point Consulting helps you to find the right ones! Would you run a Programme like this?